The OrthoSleeve BR4 Bunion Relief Sock is a first in its class! A one-of-a-kind sock that specializes in the treatment and prevention of Bunions and Bunion pain, medically known as Hallux Valgus. 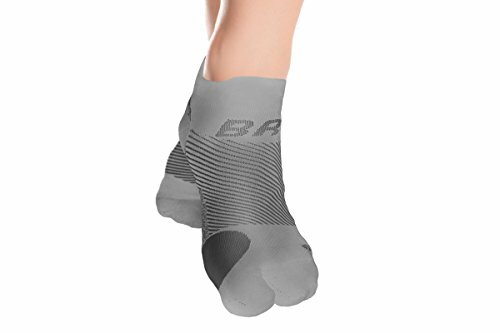 Treat yourself to relief and comfort with the OrthoSleeve BR4 Socks. The OrthoSleeve BR4 is a therapy sock that is specifically designed to relieve toe friction and bunion pain by separating the toes through our innovative split-toe feature. Our protective, supportive, and comfortable split-toe design makes this a go-to wearable relief all day long. Unlike rigid bunion splints, braces, toe spacers, or bunion pads, our BR4 Bunion Relief Socks easily replaces your normal day-to-day socks and provide the relief you desire. A built-in "relief zone" features extra padding in a specially designed zone of comfort and prevents further damage by acting as a barrier, preventing blisters and continued rubbing from footwear which can lead to increased irritation of sensitive areas. Add to that, the BR4 is made with moisture-wicking, extra durable and soft micro-fiber nylon that provides extra cushioning without the bulk. Make the OrthoSleeve BR4 your first and last choice in Bunion Relief. This is a product made by foot care experts with the highest attention to excellence in manufacturing and product development. Hand wash and air dry for extended product life. ULTIMATE PROTECTION: Bunion therapy in a thin, moisture-wicking comfort sock. Now, get bunion relief with out bulky splints. Our BR4 provides continuous relief from bunion pain & toe friction; Supports the arch & overall foot structure; protective, supportive, and comfortable split-toe design makes this a go-to for wearable relief all day long. DESIGNED TO FIT: Anatomically correct therapy sock that targets, treats and helps toe friction, bunion pain and controls symptoms of Hallux Valgus, and using our specifically designed split-toe design allows comfortable separation of the big toe. QUALITY BREATHABLE/ANTI-ODOR: Made with the highest quality micro-nylon/Lycra spandex combination; treated with anti-microbial agents and moisture-wicking makes our BR4 odor controlled and breathable by eliminating moisture build-up to keep your feet cool and fresh all day. COMFORT & SUPPORT: Seamless comfort design and targeted padding provides support to the foot and toes to keep your feet healthy in a more wearable option. Four targeted zones of compression promote circulation, reduce friction, and aid recovery. If you have any questions about this product by OrthoSleeve, contact us by completing and submitting the form below. If you are looking for a specif part number, please include it with your message.